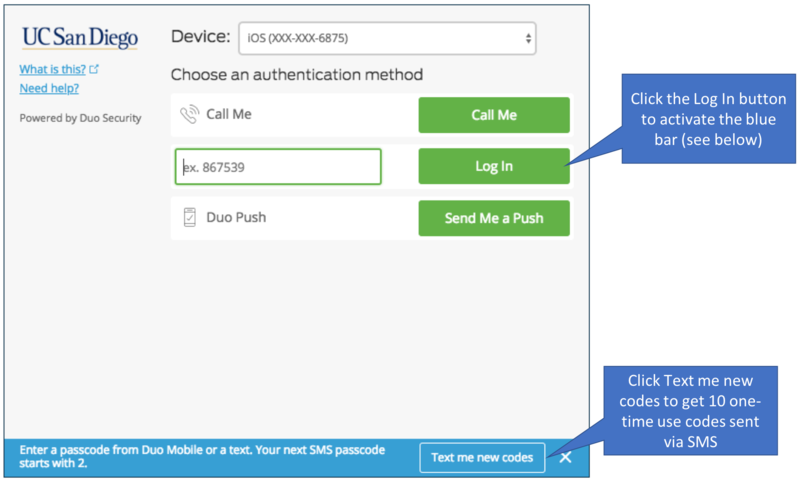 Learn how to re-name existing devices or add new ones, and tell Duo your preferred method of completing two-step login. In order to make changes, you'll first need to use an existing, registered device to verify your identity. 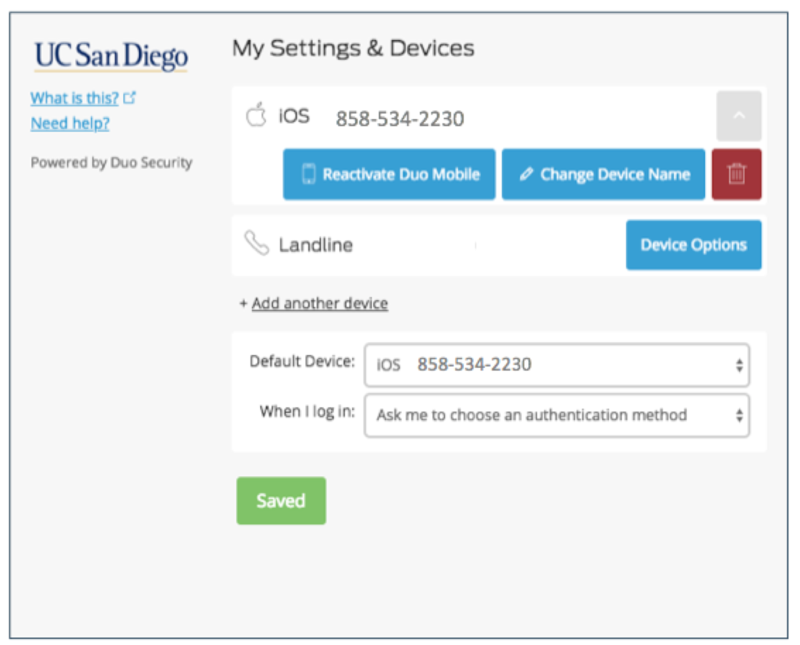 Use the "Add another device" process to register a second (or third or fourth) device for your two-step login process. The interface will walk you through the process. 1. 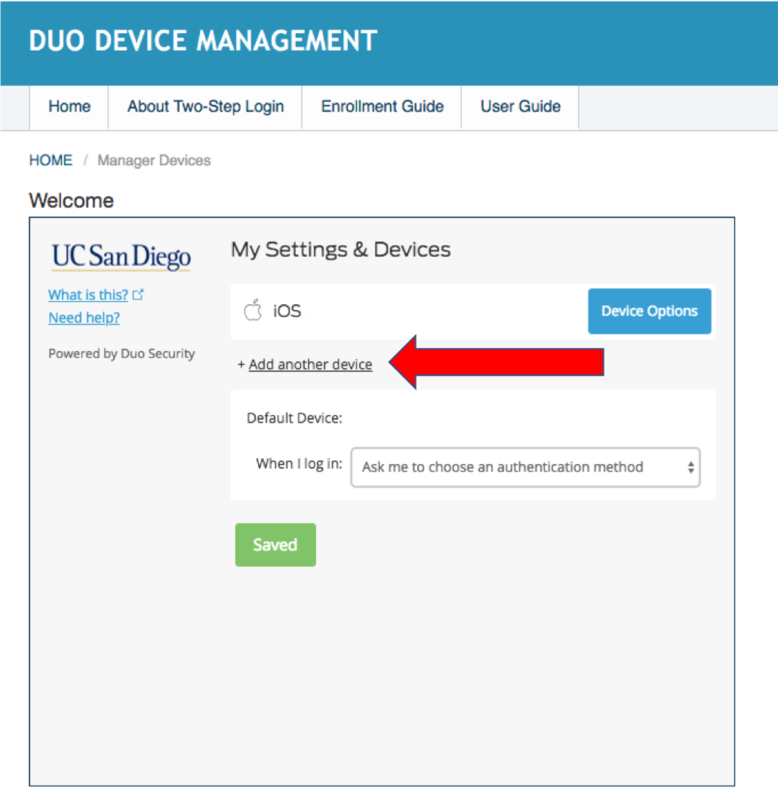 Visit the two-step login device management link (https://duo-registration.ucsd.edu) and use Active Directory to log in. 2. Use an existing, registered device to verify your identity through the two-step process. 3. Click Add another device (notated below with red arrow). Follow the prompts to add a device. You have options on how you want to complete two-step login. The Default Device section lets you toggle between your registered devices. The default device will be the first method used to complete the two-step login process. The "When I log in" section provides options for completing two-step login. You can set a method that's automatic (ie, send a push) or choose each time you attempt a login. If you get a new phone with the same number, follow the reactivation process to use it for two-step login. If your new phone has a different number, use the device manager to delete the old phone and use the Add another device process (above) to register the new phone. 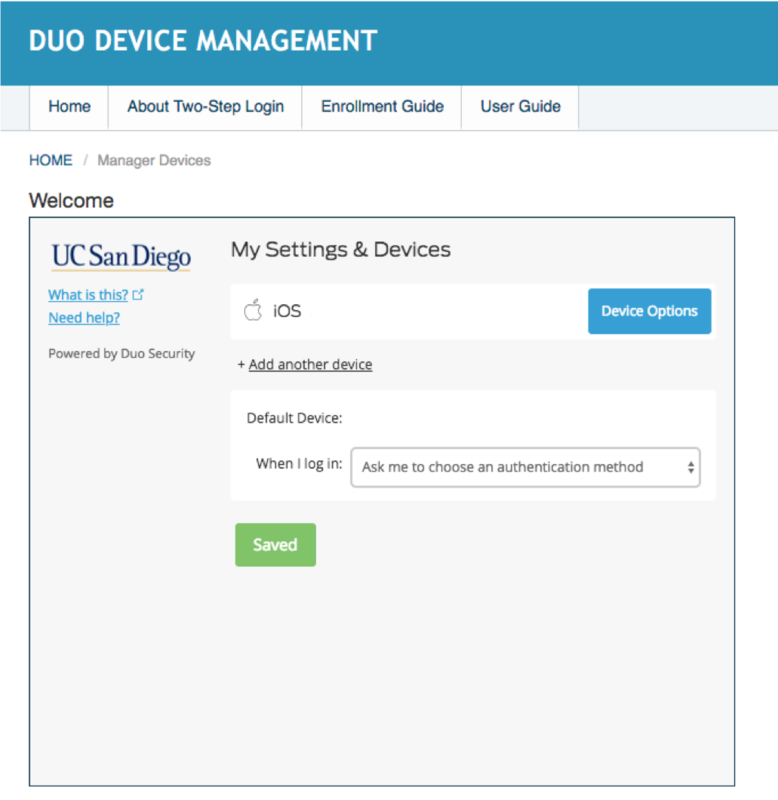 Go to the two-step login device management page (https://duo-registration.ucsd.edu); log in with your Active Directory credentials. 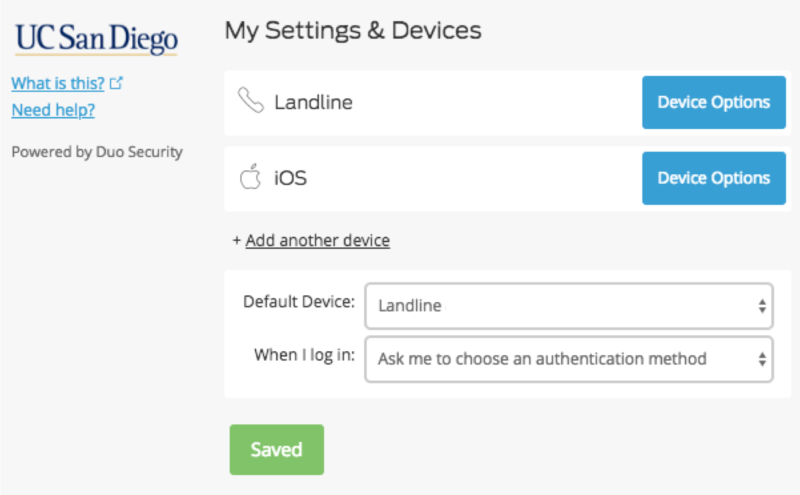 Complete two-step login process by selecting the Call Me button. Select the Device Options button. Make sure the number you see matches the number of your new phone. Select the Reactivate Duo Mobile button. Follow the prompts to reactivate the device; the prompts will be similar to the first time you registered. 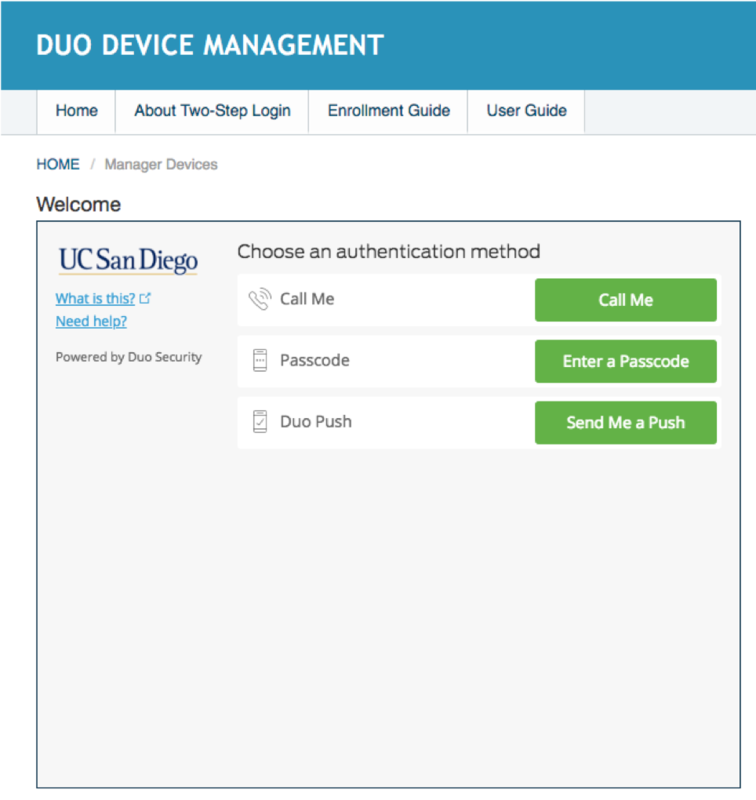 Visit the device registration portal (must be on UC San Diego network or connected via VPN). Click the green button Enter a Passcode, then click Text me new codes in the blue band that appears at the bottom of the interface. See image below. Store your passcodes in a secure location, such as a password manager. LastPass is a good choice. You'll need to have registered a cellphone for two-step login before you can receive the batch of passcodes. The codes can be used in any order. Once a code is used, it is ineligible for future use (Duo tracks used codes). A limited number of tokens (pictured below) are available for distribution. When completing two-step login, enter the temporary passcode shown on the token screen. 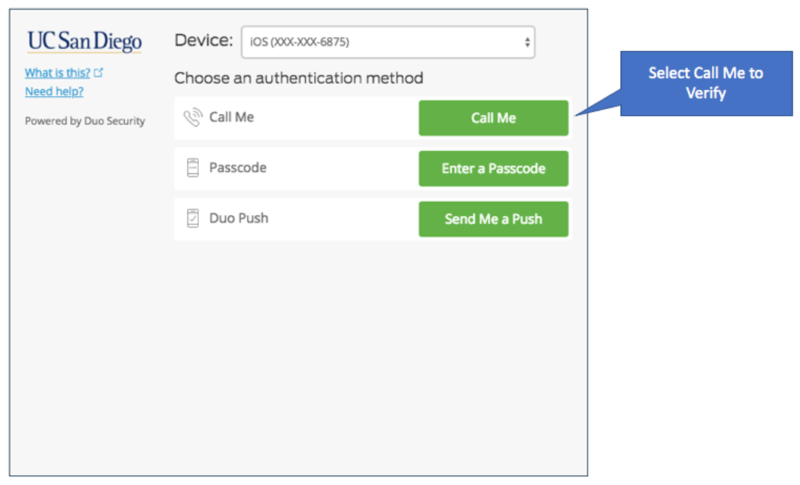 A passcode can also be generated from within the Duo phone or tablet app. The app-generated passcode is accessible even without a cell or wifi connection. Whether you're on a flight or a ship, traveling internationally or working in a subterranean bunker, if you're using the app and have the device, you should be covered. Best practices call for registering multiple two-step login devices. Even with a token, you'll want a backup plan for the day you lose it or leave it at home. Therefore, please read up on the various ways to complete two-step login and ensure you have multiple options. First things first, you'll need to register yourself in our Duo account. Start here: https://duo-registration.ucsd.edu. After logging in via Active Directory, click the green "Start setup" button. At this point we at least have a record of your identity, and can associate it with a token. This is the minimum first step. Carry on with registering other devices, per university best practices. Request a token from the Service Desk at servicedesk@ucsd.edu or 858-246-4357. Please provide your name, department, mailcode and a brief statement outlining why you're requesting a token. On-campus personnel can make arrangements to pick up their token from the Service Desk or have it delivered via campus mail. Off-campus personnel can make arrangements to have it mailed or shipped to their location. Once you've registered multiple devices you may want to rename them - for example, personal cellphone, university cellphone, office landline, home landline, etc. 1. 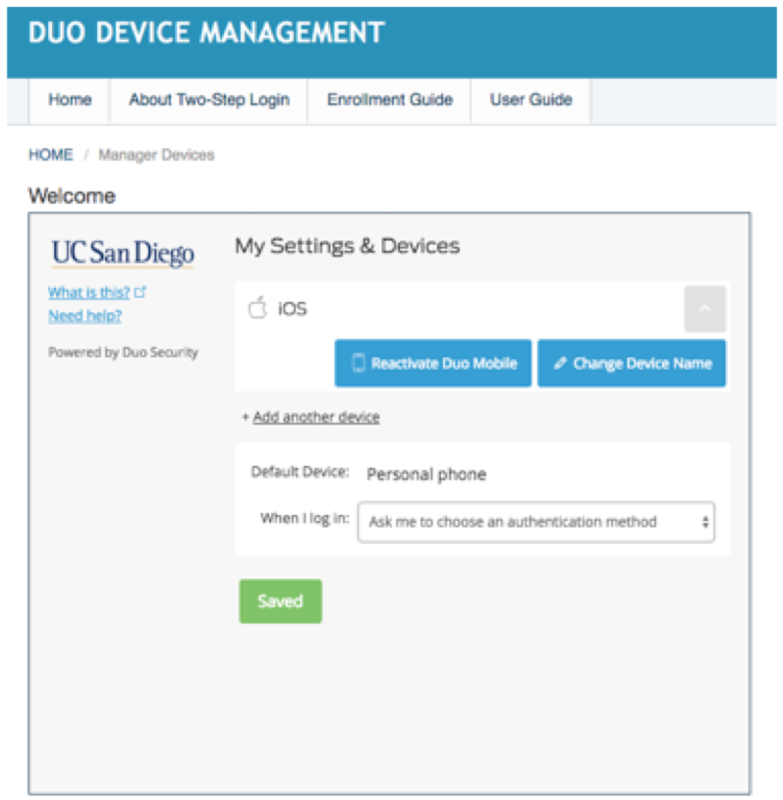 Visit the device management interface (https://duo-registration.ucsd.edu/) and log in with Active Directory. 3. Click the blue Device Options button. 4. Select the Change Device Button name and type new name in the field. Click Save when done. 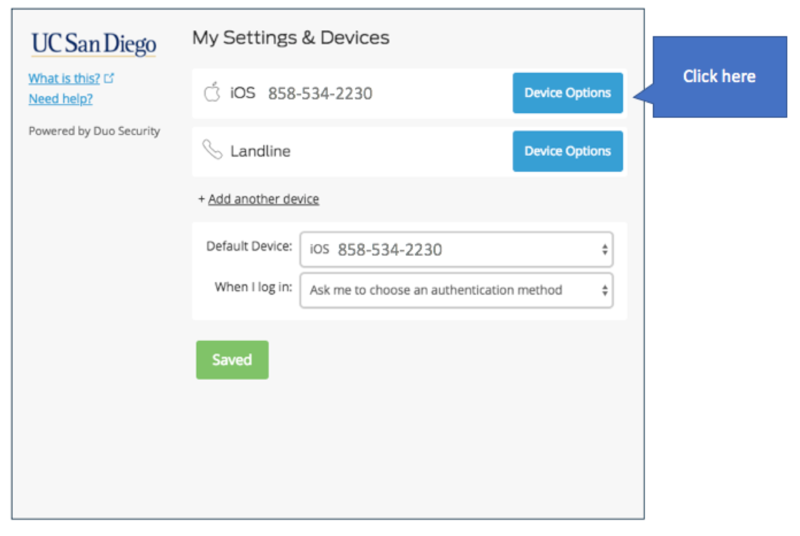 This guide on the Duo web site provides step-by-step instructions on adding/ managing devices and setting the default authentication method.